Please note that as time goes on, we will eventually replace some of the older meters with new ones that can be read more efficiently by our meter readers. The large sweep hand on the dial measures water use in gallons or cubic feet. One gallon or one cubic foot of water passes through the water meter as the sweep hand moves from one number to the next (e.g., 0 to 1). A complete rotation equals 10 gallons or 10 cubic feet depending on the unit measured. Most analog dials have a low-flow indicator that turns as water moves through the water meter. This typically looks like a small triangle (shown), star or gear. Analog Example: The sweep hand is on the “1” so the read is 1,356,411 gallons. The last number on the right is a static zero (does not change). When the sweep hand is on the “3” the read will be 1,356,413 gallons. The electronic meter needs light for activation so you may need to shine a flashlight on it. The display alternates between the meter read and the flow rate. 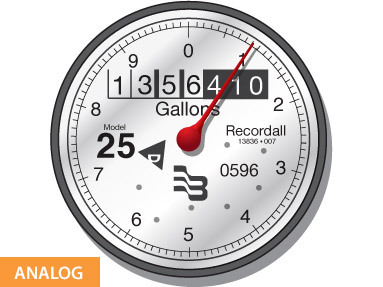 The meter read equals the gallons used while the flow rate equals the number of gallons per minute flowing through the water meter. 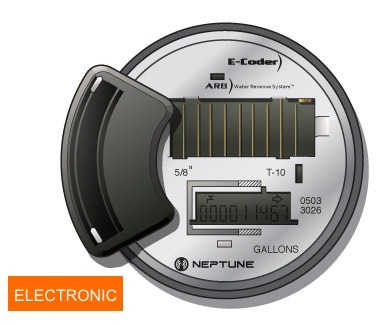 Our electronic meters allow review of historical water use. This feature helps track water use trends such as when leaks have occurred.